This schedule is subject to change. Last updated Thursday, May 25, 11:01 p.m. PDT. A Copa Comunidad tradition. Connect with friends new and old. Eat good food. Housing hosts and guests will meet here. Location: Jessica V’s House (Mid City/Baldwin Hills). Convenient to LAX! Parking & Transportation: Parking is difficult, so please, please Lyft it, carpool, or if you must drive, your best bet is to look for parking on Clyde Ave. The first 3 cars may block the driveway. Metro Expo Line is nearby. What do I bring? : Reusable plate, cup, and flatware for meal; BYOB! 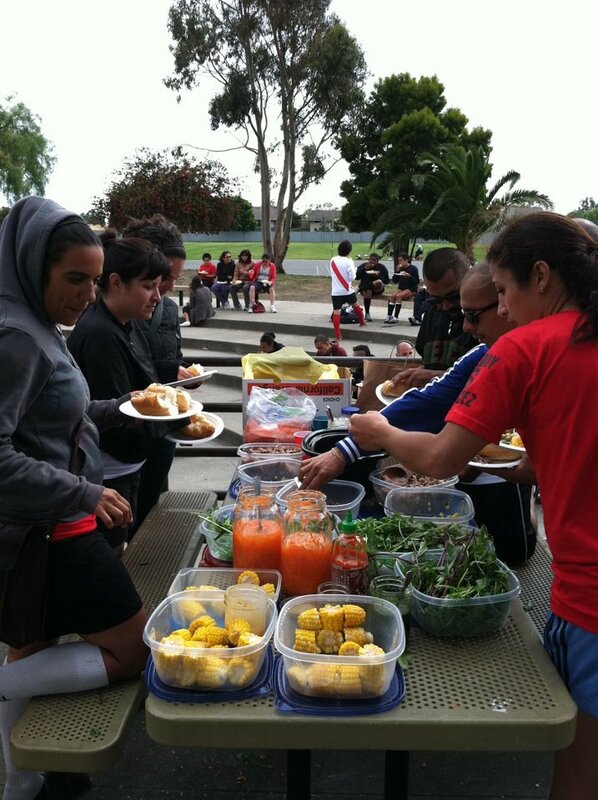 LA Futbolistas: Please bring salad, fruit, dessert, or beverage to share! Plática and fútbol on May 27 will be in the same location. Including opening circle, intention setting, drills, and games. Starts off with the women’s, trans, and gender nonconforming game. What’s to eat? (included in reg fee): Light snacks (breakfast) and tortas (lunch) by Johnson and Jamonn. Ain’t no party like a Left Wing party cuz a Left Wing party don’t stop. Music performances start at 9, followed Left Wing DJs. Don’t miss out! Parking & Transportation: Street parking; permit required 2am–6am. You are encouraged to Lyft, carpool, etc. What do I bring? : Reusable plate, cup, and flatware for snacks and drinks; light jacket or sweater in case it gets chilly (we’ll be outdoors); swimsuit (there’s a pool! ), and your dancin’ shoes! BYOB. What’s to eat? : Snacks and some drinks only. BYOB. Rest up, explore LA, or take care of that hangover. 🙂 Take some time to relax. Enjoy it! There are no formal plans for Self-Care Morning, but folks may organize activities on the fly. Please share on Facebook event page! Location: Wherever you are, that’s where you’re supposed to be! What’s to eat? : No meal provided. You’re welcome to grab breakfast/brunch on your own! We invite the Left Wing crew to join us in Downtown LA at the Los Angeles Community Action Network (LACAN) to see what the struggle for justice looks like in our local communities. Presentations will cover racial, social and environmental justice topics such as the anti-displacement battles in LA’s rapidly gentrifying Skid Row, LAPD spying and police brutality, and environmental racism in historic Watts. Following the presentations, we will take to the streets and march to the detention center at Alameda & Aliso streets. A final banner drop over the freeways will symbolize our solidarity with justice struggles locally and across the world. Parking & Transportation: Street parking. Metro Buses 18, 53 and 62 stop right outside the building. What’s to eat? (included in reg fee): Lunch will be served by the amazing Sita Bhaumik at LACAN at 1 p.m. It will simultaneously serve as our sustenance for the day, but also as an opportunity to experience Sita’s social justice and food art first hand. We encourage folks to arrive on time to get the full experience. Please also bring your own washable plates and silverware. DO NOT BRING ALCOHOL! Background: The mission of the Los Angeles Community Action Network (LACAN) is to help people dealing with poverty create and discover opportunities, while serving as a vehicle to ensure we have voice, power and opinion in the decisions that are directly affecting us. The three overarching goals are to (1) organize and empower community residents to work collectively to change the relationships of power that affect our community, (2) create an organization and organizing model that eradicate the race, class, gender barriers that are used to prevent communities from building true power, and (3) eliminate the multiple forms of violence used against and within our community to maintain the status quo. What’s to eat? : No meal provided. What’s to eat? (NOT included in reg fee): No food. Footsie’s is a bar, but there is an IHOP across the street (24 hours), a restaurant a few doors down called Juanita’s, and several late night taco stands in the area. Break bread with your Left Wing family one last time! What’s to eat? (included in reg fee): TBA. BYOB. Ramadan begins on the first night of Copa, May 26. Some members of our Left Wing family will be observing a daytime fast as a result. Please be mindful of this as we learn and grow together this weekend. These events are not sponsored by Copa Comunidad LA or Futbolistas, but nonetheless are open to our community.